Sepsis Risk For Newborns Reduced By Probiotic Bacteria : Goats and Soda Each year more than 600,000 babies die of sepsis. Researchers have found a simple way to prevent it: Feed babies probiotic bacteria that are common in kimchi, pickles and other fermented vegetables. Sepsis is a top killer of newborns worldwide. Each year more than 600,000 babies die of the blood infections, which can strike very quickly. "All the sudden the baby stops being active. It stops crying and breastfeeding," says Dr. Pinaki Panigrahi, a pediatrician at the University of Nebraska Medical Center College of Public Health, who led the study. "By the time the mother has a chance to bring the baby to the hospital, the baby dies," he says. "In hospitals in India, you see so many babies dying of sepsis, it breaks your heart." "We screened more than 280 strains in preliminary animal and human studies," Panigrahi says. "So it was a very methodical process." But that's not all. The probiotic also warded off several other types of infections, including those in the lungs. Respiratory infections dropped by about 30 percent. "That was a big surprise, because we didn't think gut bacteria were going to work in a distant organ like the lung," Panigrahi says. The treatment worked so well that the safety board for trial stopped the study early. "We were planning to enroll 8,000 babies, but stopped at just over 4,000 infants," Panigrahi says. Panigrahi estimates a course of the probiotic costs about $1 per baby. "It can be manufactured in a very simple setting," Panigrahi says, "which makes it cheap." Now if you think about what's going on here, it almost seems counterintuitive. Remember sepsis is a bacterial infection. So the researcher are preventing a bacterial infection with bacteria. How is that possible? "Essentially these bacteria have a whole number of health benefits that we have just started to understand in the past couple of years, says Dr. Pascal Lavoie, a neonatologist at BC Children's Hospital in Vancouver, British Columbia. 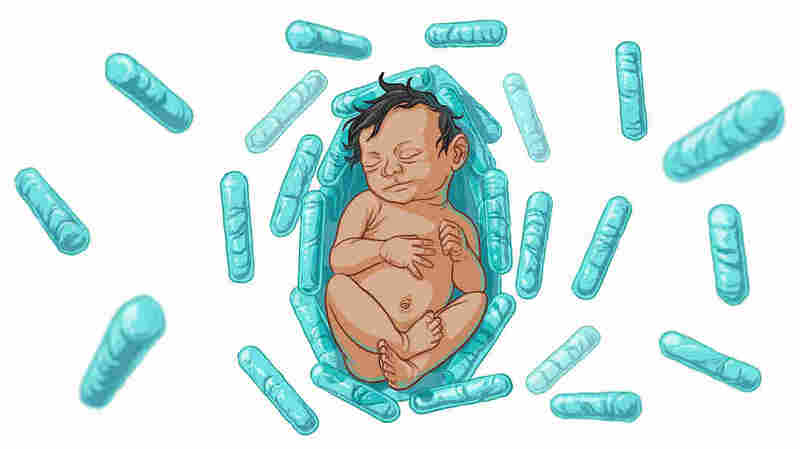 First off, these beneficial bacteria can push out harmful bacteria in the baby's gut by changing the environment or simply using up resources, Lavoie says. The probiotic bacteria also produces a compound that strengthens the wall of the intestine. "It acts as a barrier to prevent the bad bacteria from going through the wall into the blood," he says. And, the probiotic bacteria can jump-start a baby's immune system. "They can promote maturation of the immune system in a healthier way," Lavoie says. "Probiotics can be much more powerful than drugs." "Sepsis is such a important problem around the world," Lavoie says. "This study has huge potential."